HOUSTON and CAMP HILL, Pa. — Rite Aid Corp.’s RediClinic subsidiary has reopened 21 of 22 in-store clinics in the greater Houston area that were closed because of Hurricane Harvey. 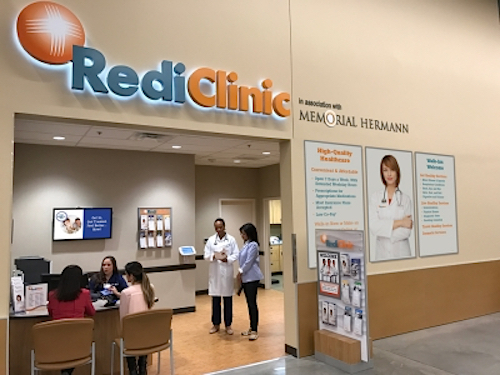 Though Rite Aid doesn’t have any pharmacies in Texas, RediClinic operates 36 convenient care clinics inside H-E-B supermarkets in Houston, Austin and San Antonio. All Austin and San Antonio RediClinics are open. RediClinic’s Kingwood location, inside an H-E-B store, is still closed because of the flooding from Harvey. RediClinic said its Kingwood location remains shut due to flooding, and its patients are being directed to the nearby Atascocita clinic until further notice. The greater Houston area clinics are operating on a modified schedule, from 9 a.m to 6 p.m. RediClinic said clinicians can provide immediate treatment for acute/episodic conditions affecting Houstonians in the wake of Hurricane Harvey, such as upper respiratory conditions and ear infections, as well as administer tetanus vaccinations. Meanwhile, the Rite Aid Foundation has announced a $100,000 donation to the American Red Cross to help the victims, families and communities impacted by Hurricane Harvey. Making landfall Aug. 25 on the Texas Gulf Coast, Hurricane Harvey was the first major hurricane to strike the continental United States in 12 years. Over a four-day span, many areas — including greater Houston — were deluged with more than 40 inches of rain as the system stagnated in the area before moving toward eastern Texas and Louisiana. The ensuing floods swamped hundreds of thousands of homes, displaced more than 30,000 people and led to over 17,000 rescues. About 60 people have been killed.